Reblog - Willem Toet - What parts of a Formula 1 car generate the main aerodynamic forces? Here I present what I have learned. However there must be lots of you out there now with experience of work on F1 or other open wheeled designs even if at a university. What’s your experience? If you have a lower % of downforce created by the floor as I have defined it via the image above then perhaps the design in not yet mature – especially if it is to the present aerodynamic regulations. The image above shows the downforce and drag acting on an early 2009 F1 car broken down into the direct contributions of some of the main groups of components. Some parts create lift, not downforce. The front suspension, for example, creates lift, but, if we redesign it to make it neutral in terms of downforce, then the total downforce of the car reduces. Parts are very interactive and work as a whole. This sort of breakdown of forces will vary for every car but alters most when teams dramatically change downforce level, such as for Monza (high speed track so lower drag level) or if regulations change. 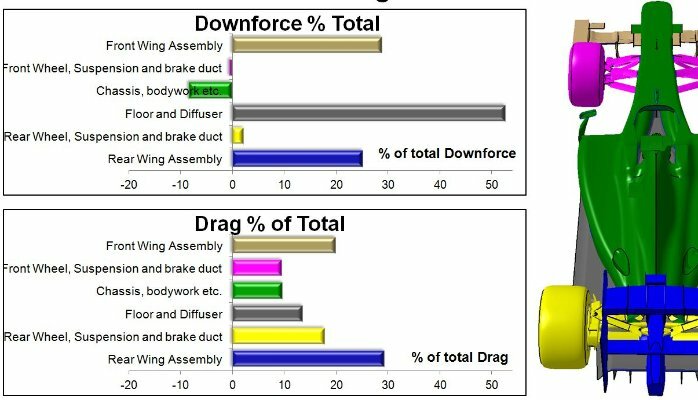 This force distribution is for a car that is still young in terms of aerodynamic development – later, better designs allowed a further increase in the percentage of downforce created by the floor. The floor and the front wing are the “efficient” downforce generators typically on a Formula 1 car. When you improve overall efficiency often it is achieved by increasing the power of your more efficient devices. This then becomes one of the normal development strategies for the aero people –i.e. how can we get more clean, high energy air to that component? The rear wing, in this example, is directly responsible for 25% of the downforce and nearly 30% of the drag. 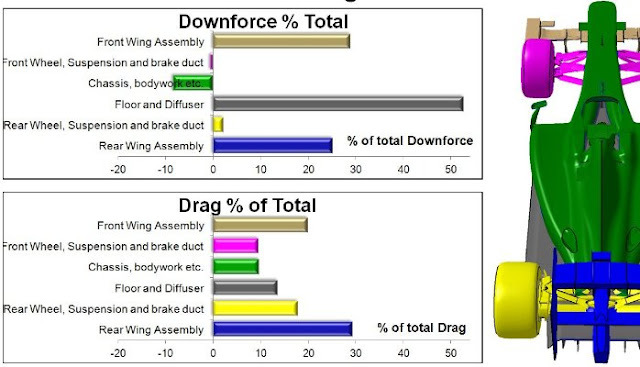 However, if it is removed (or if it is lost in an accident), then the overall impact is bigger than the forces that normally act on the assembly directly – about 34% of the downforce of the car (and over 40% of the drag) is lost because the whole flow field around the car is changed. If the rear wing is removed front downforce is increased, most of which is a mechanical load transfer effect because the front wing is ahead of the front wheels. So clearly rear downforce is dramatically reduced. If a rear wing is ‘lost’ on the track, the result is almost certainly a dramatic spin and an accident due to this significant imbalance. Most drivers say such a loss makes the car undrivable. Rules have been changed from time to time to reduce the risk of this happening. Teams are highly motivated to keep rear wings (in particular) on the car! On the other hand, the behaviour of the car without a front wing (understeer) is more likely to be predictable and controllable, and usually drivers are able to get the car back to the pits if that is the only damage. A nose change takes a typical F1 team less than 10 seconds. The F1 rules really are now designed to limit how much downforce a Formula 1 car can generate. This means that F1 aerodynamicists work with less direct means of managing the airflow to achieve their objectives. One objective is to get lots of high energy air to their most efficient downforce generating components. Another may be to mix up the air flow so that high energy air which may normally pass under or over the car without doing any work is put into contact with surfaces that can extract performance from it. The image above shows vortex structures colored by total pressure or energy around a more recent F1 car. These aerodynamic structures replace the physical devices that would be used if the regulations allowed that to be done. 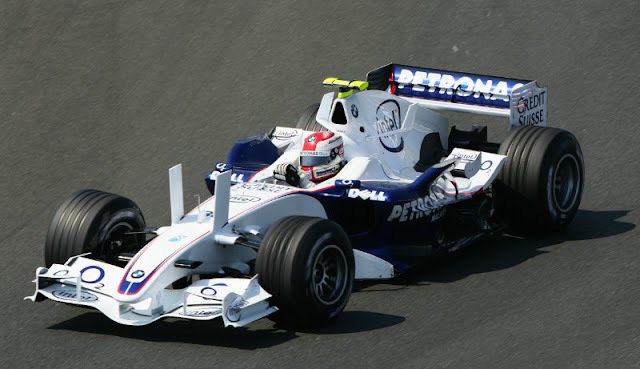 Robert Kubica driving the 2006 BMW Sauber (image courtesy of BMW). The "twin towers" as the team called them moved high energy air that would otherwise pass out of the back of the vehicle to a place where other devices could turn them into downforce. Even then rules prevented directly putting devices where they would have produced downforce. This concept raced once before being banned on safety (driver vision) grounds.